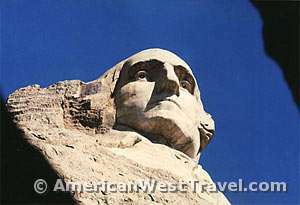 One of the most impressive landmarks of the American West is the famed sculpture of the presidents at Mount Rushmore National Memorial in the Black Hills of western South Dakota. Since its completion in 1941, the sculpture has become an inspiring symbol of American democracy, visited by millions of people every year. 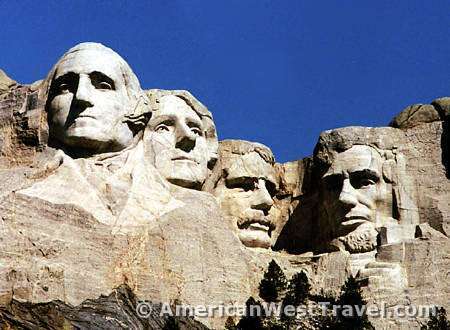 The sculpture depicts the visages of presidents Washington, Jefferson, Lincoln, and Theodore Roosevelt, and at the time was intended to represent the first 150 years of American history. The granite faces are sixty feet tall, and together are one of the largest statues in the world. 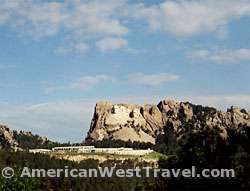 Mount Rushmore was conceived and sculpted by artist Gutzon Borglum. His story is almost as dramatic as the monument itself. Borglum and his supporters fought for years on behalf of the project against local and national opposition and skepticism. Always short on financial support, and facing tremendous technical challenges, he started work in 1927 and persisted through the miserable years of the Great Depression before completing the faces in 1941. During the 1990's, the memorial was redeveloped and received an enormous facility upgrade. This included a major concession building for dining, snacks, and gifts; a new museum building with two theaters; a major new viewing area, Grand View Terrace; and the Avenue of the Flags (shown right), which features the flag of each state. The Presidential Trail was also constructed. This trail allows visitors to access the foot of the mountain for the first time and get great closeup views of the sculpture. This, of course, has upgraded Mount Rushmore to a very major and busy tourist attraction. During my last visit in 1974, the memorial was more of a backwater and not at all hectic as it is now. At that time, quiet contemplation was the order of the day. 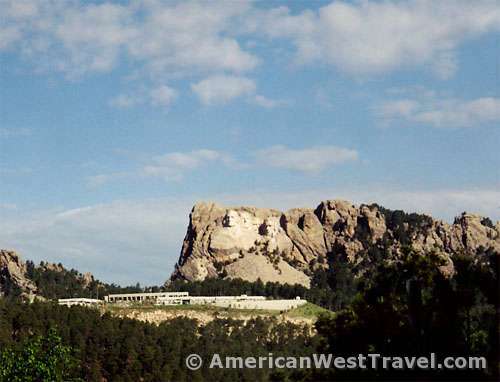 The story of Borglum and Mount Rushmore is not entirely without controversy. It is said that Borglum was a strong advocate of "manifest destiny", in the sense of desiring the complete elimination of Indian sovereignty. 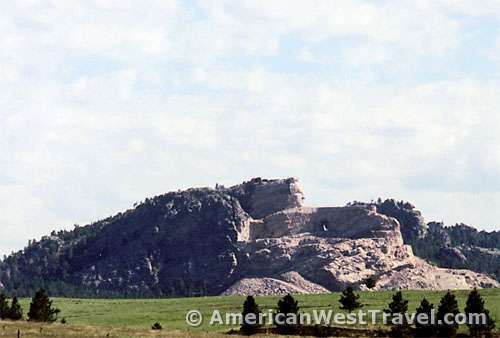 The locale in the Black Hills, an area which was harshly wrested from the Lakotan Sioux, may have been a pointed message to these Native Americans. The Crazy Horse Memorial (below) was most likely an explicit response to Mount Rushmore. Our featured book (right column, top) covers this and other interesting topics. A short distance from Mount Rushmore, the colossal statue of the famed Sioux warrior, Crazy Horse, has been under construction since 1948. When completed, the statue will depict Crazy Horse on his mount, arm pointed forward, and will be by far the largest statue in the world, 641 feet long and 563 feet high. The face, completed in 1998, stands 90 feet tall. Several Lakotan chiefs approached sculptor, Korczak Ziolkowski, regarding the project as early as 1939. They wished, of course, to commemorate a great Native American hero on a grand scale. Crazy Horse, along with Chief Sitting Bull, had led the Sioux warriors against Custer at the Little Big Horn. 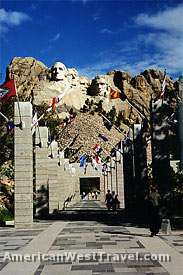 Ziolkowski had worked for a time at Mount Rushmore, assisting Gutzon Borglum. He commenced the Crazy Horse project in 1948, and worked on it until his death in 1982, enduring much physical hardship along the way. Since that time his wife, Ruth, and family have continued his work. The completion date of the statue is unknown. Construction could go on for generations, given the vaguaries of fund-raising and the harshness of the weather on the northern plains. Since the beginning, the project has refused to accept any government funding and is entirely dependent on private donations. Over the years the facility at Crazy Horse Memorial has grown into a major Native American cultural and educational center. More information may be found at: www.crazyhorse.org. 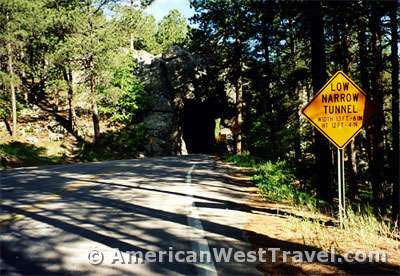 Access to Mount Rushmore from the south, over Iron Mountain, is provided by the famed Norbeck Scenic Highway. The route is considered one of America's finest scenic drives. 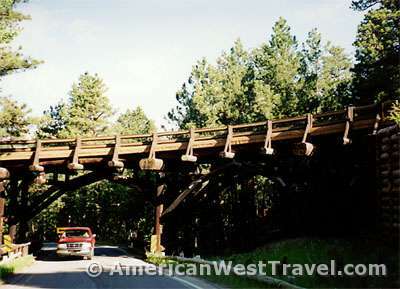 It combines beautiful scenery, sometimes grand vistas and sometimes lovely forests and glades, with extremely unusual road engineering. There are numerous scenic one lane tunnels as well as several unique "pig-tail" bridges (left and right, below). These bridges reduce elevation without the need for a switchback. The road simply comes off the bridge, curves in a complete circle, and proceeds forward below the bridge. 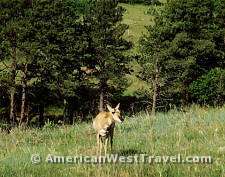 The Black Hills region around Mount Rushmore and Custer State Park is exceptionally rich in wildlife. At left, one of several pronghorns grazes alongside the road. These animals are often called antelope but that is technically incorrect. The most exciting observation was a small group of mountain goats next to the road about five minutes from the Mount Rushmore entrance station. It was impossible to stop for a photo due to the heavy traffic in the area. Former Newsweek editor John Taliaferro calls Mount Rushmore "one of the nation's most luminescent beacons of democracy," ranking up there with the Liberty Bell and the Statue of Liberty. Yet comparatively little is known about its remarkable genesis. He tells the story of how Rushmore was conceived and built, and why controversy surrounded the project from the start. Bookstore owner and South Dakota resident Laural A. Bidwell offers her firsthand experience and advice on Mount Rushmore and the Black Hills-including the Southern Hills, the Badlands, and Keystone. From Interstate-90 in Rapid City, South Dakota, take exit 57 and head south on US-16 about 20 miles. Turn left on US-16A through Keystone (4 miles), then right (west) on SD-244, about 4 more miles. 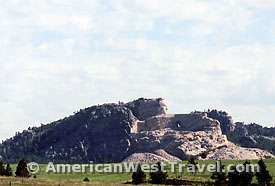 To visit Crazy Horse, continue west on SD-244, then south on US-16/385. It's about 15 miles from Mt. Rushmore.